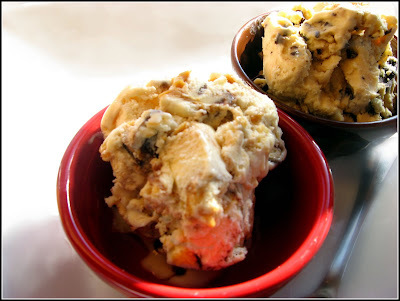 Creamy peanut butter ice cream loaded with chopped up chocolate covered peanut butter crackers. Heat the cream, granulated sugar, brown sugar, and peanut butter, in a large saucepan, over medium heat, stirring frequently, until mixture is hot, and starts to bubble. Whisk the egg yolks in a large mixing bowl, until well combined. Gradually whisk half of hot cream into egg yolks, until well combined. Return egg-cream mixture back into saucepan, and continue to cook, stirring constantly, until mixture thickens, and coats the back of a spoon (custard should be 170-175 degrees F). Strain the custard into a large mixing bowl. Into bowl, whisk in half-and-half, and vanilla. Chill bowl in the refrigerator until cold, about 2 hours, or refrigerate overnight. Meanwhile, make the "Tagalongs". Melt the chocolate over a double boiler, or use the microwave, which is what I prefer. Heat the chocolate in a small bowl, in the microwave, stirring every 20 seconds, until chocolate is melted, about 1-2 minutes. Make sandwiches by spreading the peanut butter onto the crackers or shortbread cookies. Dip the crackers/cookies into the chocolate, and place on a wax paper-lined plate. Freeze the crackers/cookies for about 5 minutes, or until firm, then coarsely chop. Return to freezer until ready for use. Pour ice cream base into ice cream maker, and process according to manufacturer's direction. In the last 5 minutes of processing, add the chopped up "Tagalongs" and allow to finish churning. 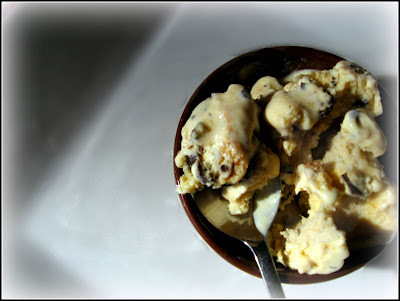 33 comments on "Tagalong Ice Cream"
That looks awesome. Tagalongs are the only GS cookies I like. Chocolate and PB are always a winning combination. Time to dust off my ice cream maker. Now that my neighborhood is lacking is ice cream places, I have to make my own more often. Just one thing some of the pictures didn't show. I just ordered Girl Scout cookies on Friday, although I didn't get any tagalongs. Now I'm wishing I would have! No Tag Alongs here in Canada. Girl Guides only sell Thin Mints and the oreo style vanilla & chocolate ones. I can imagine the flavours of your ice cream though!! Omg your ice cream looks way better than the store-bought. Also, at first glance I thought it said "Tagalog" ice cream and I was like "they have a special ice cream in the Phillipines?" That ice cream looks good enough to eat on a snowy day! Yours looks so much better... Gotta try it soon, Emiline! I will definitely have to try this recipe- I really prefer making homemade without all the junk in it, so it's nice to come across a homemade version of something so yummy! Wow,this looks so incredible! Those darn tagalongs are one of my favorite cookies! Hope to try this! oh my gosh, that looks just amazing. my ice cream maker is dying to make me this! when i was little, my favorite girlscout cookie was always thin mints, but now i've discovered that i love samoas (sp?) even better! i bet i would love this too. Am I the only one who *actually* prefers the coconut cookies? :-) Seriously, now I want some tagalongs though! Ice Cream is my weakness I will pick that any day of the week (or time of the month for that fact) and this looks really good. I got an icecream maker for my KitchenAid for chistmas but I don't have it yet (backorder) I can't wait to try this. I'm not a MASSIVE ice cream fan but that sounds (and looks) amazing. I hate when a limited edition flavour of something is brought out and you end up loving it - but at least in your case you try and do something about it by inventing your own! Oh, my that looks good. what an awesome idea! i'm very impressed-- and very much wanting to try some! How I wish you were my neighbor! My god that ice cream looks too good for words! 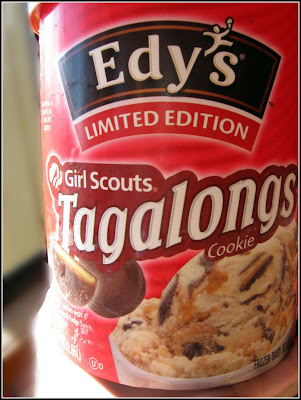 I also love the cold creamy stuff, although I haven't tried the tagalong. Now I must! Thanks for giving me more reason to go off my not so serious diet! My favorites, girl scout cookies and ice cream. Yours looks so good! Those snowflake Ritz are cute. I wish I had seen these at Christmas time, ugh! How come i don't have a next door neighbor that makes her own ice cream! I'm a professional taster! 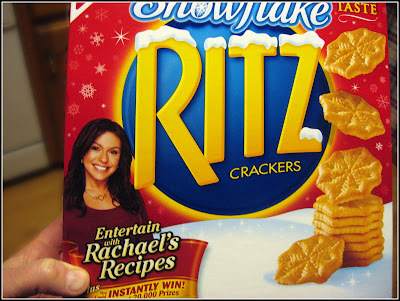 My sister made me dig through the shelves once until I could find a box of Ritz that didn't have Rachel Ray's face on it. She's scary! Oh wow, that sounds just awesome! I am ice cream obbsessd too - so I know just how you feel. I felt that way when haagen daaz had limited edition Sticky Toffee Pudding ice cream - and you know my feelings about that already! But you are just a breath of fresh air - first with the potato chips and NOW with ritz crackers! WOW! you certainly have a way with this lovely sweet salty combination I adore! Wow, I can't believe you *make* ice cream. I'm obsessed with the thin mint ice cream, but haven't had it in years because they don't sell small containers. YUM! I love making ice cream and this sounds realllllllly good. And since you're obsessed, do you have Cold Stone ice cream where you live? Talk about playing with ice cream all day. It's amazing! My internet has been down for 2 days! I could have made this incredible treat rather than rant and rave! It's....inspired. Makes me want to go mug a Girl Scout. HAPPY BIRTHDAY DAD!!! I'm assuming the cake you made him will be on your blog tomorrow. Em, you should be fined for posting such a luscious recipe. Thank goodness, I don't have (quite) that much cream in the house and it's too late to get it. I wouldn't use Ritz anyway...just because of who's on the box. Next time can you do a carrot and celery salad? its the first time i heard about tagalong..they sound really divine..choco with peanut butter!! happy bday on your dad and such a sweet recipe to go for this celebration!! would love to have a scoop of that ice cream yum!! Sorry I'm so late getting to the comments today. Rachel- Thanks! My neighborhood is lacking ice cream places, too. We have a Braums, and another small place, and I think that's it. Nuria- Ha ha- you make me laugh. Yes, this is going straight to my belly, where it will stay. Deborah- Did you? Nobody has been to out house. Maybe they don't go door-to-door, anymore. Can't say that I blame them. Valli- No Tagalongs? How sad. Heather- Ha ha... Yes, it actually snowed today, but it was really windy. Gabi- Me eating less junk is a good idea. Jenny- Thank you. Yes, I like them. Katy- I love all of those cookies. Cakespy- I think so. I REALLY like the coconut ones, too. Polly- I hate that, too. Karen- I've been thinking that shortbread cookies would be even better. Shayne- Make some when you get the chance. I love making ice cream. Not too difficult. Annie- I wish you were my neighbor, as well. Then I wouldn't eat so much of this stuff. Kate- I'm glad you like the snowflake Ritz. I think we bought them before Christmas. Zen Chef- I would love to have a neighbor that I could give ice cream to. Ours our too nutty, though. Gloria- Blackberry ice cream sounds good. Srah- Yes, yes she is. 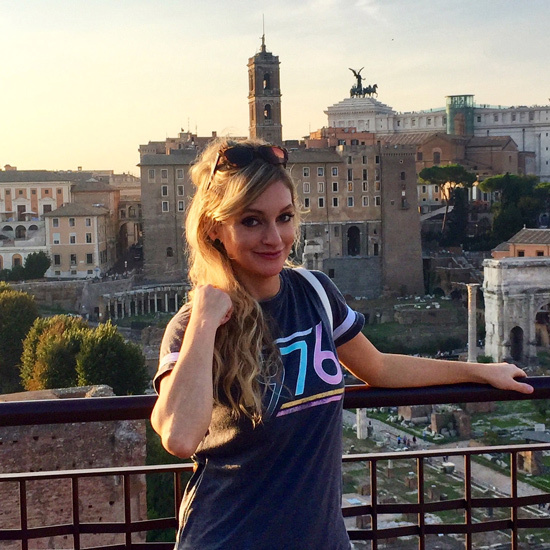 Jenn- I love sweet & salty. Tanya- I love making ice cream! I do it all of the time. It's not a big deal. Kelly- We do, but I haven't been. I want to. Cat- I'm sorry about your internet! I hate when that happens. Sue- I'm sure my dad will be happy with your message. The "dessert" will be featured later this week. I even made a little video. Dhanggit- Tagalongs are one of life's little pleasures. That looks amaaazing! I love me some Tagalongs. My family and I met the guy who is the professional taster for Edy's! I swear! He tastes every batch of ice cream that leaves the factory. 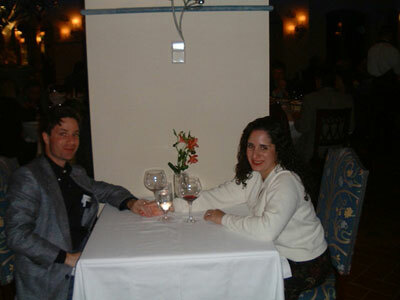 I wrote about it on the blog, but I don't know if you were reading it back then. I don't want to sound like I'm plugging my blog on your blog, but if you're interested, just go and search for "Flavorologist." Anyhoo, the ice cream sounds deelish ... if I weren't dieting, I'd have to try some. I'd buy you some Tagalongs and send them to you, but ours come around in the fall. Emiline, this sounds delicious! We can't get Tagalongs here, but they sound devine. WHAT?! this icecream?! I didn't know this existed, and now that I do...I feel like my life is more complete. :) lol. I wish we had tagalongs her in Canada. That ice cream looks soooooo good!